Brona's Books: Which Travel Guide? At work I often get asked which travel guide people should take with them on holidays. In the past I have been known to travel with up to three or four guides tucked into my backpack and suitcases. I like them all for different reasons - the weight be damned! Our recent trip to Vietnam gave me a good excuse to work out what it was about three particular ones that I liked and why. 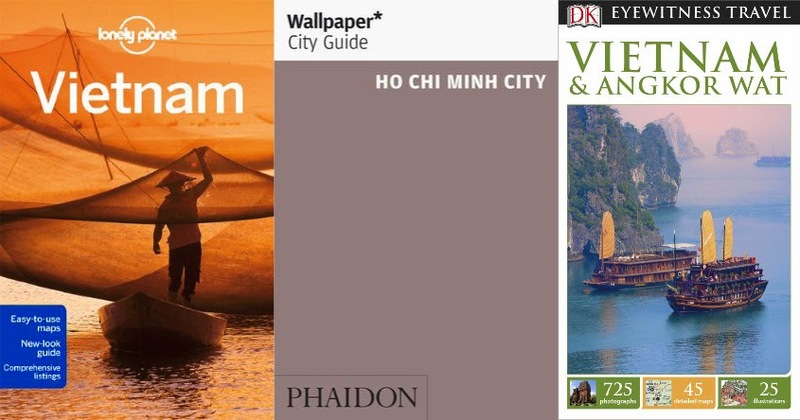 We travelled with a Vietnam Lonely Planet, a Vietnam and Angkor Wat DK Eyewitness and one Wallpaper Guide for Ho Chi Minh City. Personally I am drawn to the DK Eyewitness books. I like the glossy pictures and full page spreads featuring areas of interest. I like how they go into depth about the history and the culture. I usually find myself reading the DK on the plane heading over to get me excited about what I will be seeing and experiencing. However, some of their information for Asian countries feels secondhand or a little out of date. It's the Lonely Planet that I turn to for the details that I need. I can always count on them to give me specific information about tickets, prices and correct addresses. Their writers have been on the ground and checked out the tours and the places of interest. But the Lonely Planet folk can sometimes sound a bit cynical or jaded. I also I feel that they cater to the younger backpacker more than older traveller. And that's where the Wallpaper Guide came in. One of the many, many advantages of being an older (or as I prefer to think of it - a more experienced!) traveller is being able to afford a nicer style of accomodation and dining experience. When we wanted to know a good restaurant or roof top bar to adjourn to, the WG never led us astray. The whole shopping thing is not really my focus when I go overseas so I tend to skim those sections. But the information in the WG about the architecture and landmarks was fascinating and useful. There are so many more travel guides for Vietnam - the montage above highlights just a few of the most well-known ones. Maybe we missed something really important or really special by not travelling with one of these? Or maybe we should ditch all the travel guides? Perhaps we're missing out on a truly authentic, free-wheeling experience by not discovering everything for ourselves and working it all out as we go along? In today's modern world it's also nigh impossible to travel without our modern technologies. Supplementing our Vietnam travel books, our recent holiday also relied on dear old google maps and tripadvisor. Is all this easy information and sharing a good thing or not? Do you like to travel with a guide or two? Which travel guides do you like to travel with and why? I hope to plan another holiday again soon so I can research this very interesting topic in more depth!